In the quest for upgraded recyclable materials, research and investment in automation seem destined to keep growing. Consumers of secondary commodities, including plastic, paper, metal and wood scrap, all maintain specifications related to the purity and the quality that these materials must possess, as they are key ingredients in the goods they produce. Many of these consumers advocate for collection that is as source-separated as possible. That is, if a plant is using clear PET (polyethylene terephthalate) scrap as feedstock, the owner of the plant wants only that specific feedstock shipped to the facility without contamination. Managers of waste and recycling companies often reply, however, that to obtain sufficient volumes of a given material—including clear PET bottles—using only pinpoint targeted collection methods will come up short. This disparity between what is able to be easily collected and what materials are desired by a given consumer has helped lead to one of the priciest research and development (R&D) efforts in the waste and recycling sector this century: the ongoing quest to deploy automation to separate commingled recyclables from one another. The effort has a long history of industry stakeholders bridging mechanical, magnetic and laser-optical techniques to achieve this end goal. Some of the latest technology deployed fits into the artificial intelligence (AI) or machine learning categories with a healthy side order of robotics included. Operators of material recovery facilities (MRFs) and other recycling plants face the risk of being overwhelmed with technical terms as they sift through pitches and proposals from technology and machinery vendors. To understand the basics of these technologies, distinctions need to be made regarding the differences between AI and machine learning. AI is considered a broader category of computer systems developed to perform tasks normally requiring human intelligence, including visual perception and follow-up decision-making. When it comes to identifying and separating materials in a commingled recycling application, machine learning is a segment of AI that is playing a starring role. Companies including Europe-based TOMRA Sorting Recycling; Eugene, Oregon-based Bulk Handling Systems (BHS); Canada-based Machinex; and Finland-based ZenRobotics are among those focusing on tying machine learning into devices and systems to offer thorough automated sorting options for recyclers. 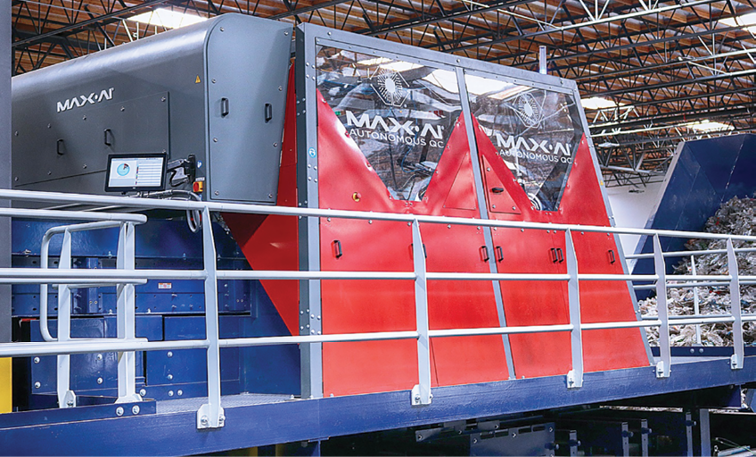 Companies such as BHS with its MaxAI systems, Machinex with its SamurAI line of sorting machinery and ZenRobotics with its Recycler have all gained attention and investments from recycling plant operators who have calculated that such advanced technology will yield a healthy return on investment (ROI). Even before machine learning became an integral part of commingled recycling sorting systems, investments in automation focused on two priorities: improving the quality of shipped secondary commodities and decreasing labor costs on the sorting line. Ménard says the SamurAI was unveiled at the April WasteExpo event in Las Vegas, and then internationally a month later at the IFAT trade fair in Germany. He says the MRF market has responded positively to it. “Machinex has officially sold eight SamurAI units, including three of them that will be running before the end of 2018,” he says. Buyers in the MRF segment are attempting to garner their ROI on the commingled container front, and they’ve turned to AI-enabled technologies to fast-track improvements in lowering contamination rates. “The majority of our applications are currently for the recovery of different types of recyclables on the reject quality control line, which mainly allows the recovery of natural and colored HDPE [high-density polyethylene], PET [polyethylene terephthalate], metals, Tetra Pak and other types of plastics otherwise missed by the previous sorting equipment,” Ménard says. Learning-enabled robots are also gaining a presence in the sorting of mixed construction and demolition materials (C&D), where objects in a commingled stream can be picked in either a negative or positive sort. Recently, robots programmed by ZenRobotics have made an impact on how operators in this space are able to sort incoming materials. Operators of mixed C&D recycling facilities face labor cost and quality control issues similar to those encountered by MRF operators. 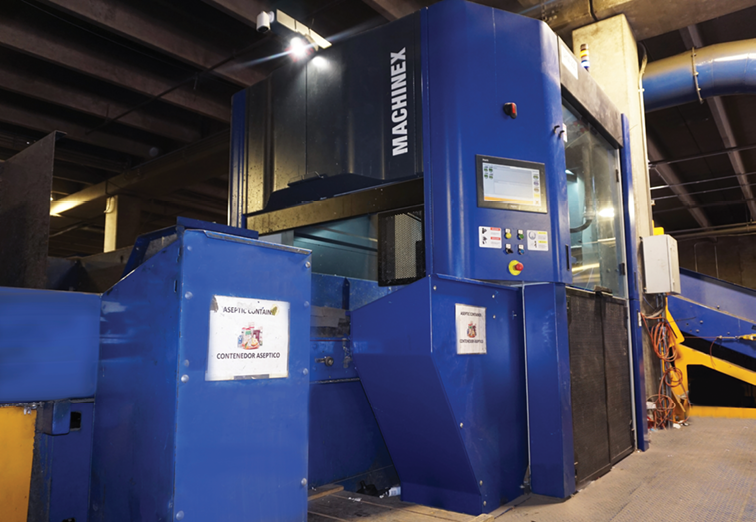 As have many MRF operators, C&D recycler Walter Biel of Austin, Texas-based Recon Services has invested in machine learning and robotics to address both of those issues. At the Recon plant in Austin, two robot arms with “smart grippers” have been programmed and deployed to pick 12 different kinds of materials, and they can separate plastics based on polymer, color, shape and size. Recon Services says the robots can make roughly 2,000 picks per hour, selecting objects with market value in a positive sort process. By comparison, according to Recon and ZenRobotics, humans can make approximately 800 such picks per hour. Whether to be a pioneer of a new technology or wait and see if early adopters benefit will be an ongoing decision-making process for recyclers of all commingled materials as AI and machine learning continue to be configured to work along with sorting devices. One thing is for sure: These technologies aren’t going away. Sorting technology companies have committed to AI, machine learning and robotics as an integral part of their future. The question is how advanced these machines can become. According to Ménard, this is an ongoing process. “We are still working with our partner [Colorado-based] AMP Robotics to further develop enhanced identification technologies and capture rates for plastics applications,” he comments. When it comes to investing in machine learning and AI sorting technology, recyclers clearly will continue to have plenty of vendors and options to choose from. By examining variables such as the type of incoming feedstocks, desired purity rates, speed, accuracy, manpower and automation, operators can help narrow their search and find the sorting solution that best fits their needs. The author is a senior editor with the Recycling Today Media Group who can be contacted at btaylor@gie.net. AGC says labor shortages likely prevented additional gains. Construction employment grew in 273 out of 358 U.S. metro areas between December 2017 and December 2018, declined in 37 and was unchanged in 48, according to a new analysis of federal employment data released today by the Associated General Contractors of America (AGC). Association officials say the job gains came amid strong demand throughout 2018 for construction projects but noted that tight labor market conditions likely prevented additional job gains last year. The Houston-The Woodlands-Sugar Land, Texas metro area added the most construction jobs during the past year (19,400 jobs, 9 percent). Other metro areas adding a large amount of construction jobs during the past 12 months include Dallas-Plano-Irving, Texas (17,700 jobs, 13 percent); Phoenix-Mesa-Scottsdale, Arizona (16,200 jobs, 14 percent); and Orlando-Kissimmee-Sanford, Florida (11,400 jobs, 15 percent). The largest percentage gain occurred in Weirton-Steubenville, West Virginia/Ohio (28 percent, 500 jobs), followed by Hartford-West Hartford-East Hartford, Connecticut (23 percent, 4,300 jobs); Bridgeport-Stanford-Norwalk, Connecticut (23 percent, 2,600 jobs); and Lewiston, Idaho/Washington (23 percent, 300 jobs). The largest job losses in that time period occurred in Anaheim-Santa Ana-Irvine, California (-2,800 jobs, -3 percent), followed by San Diego-Carlsbad, California (-1,900 jobs, -2 percent) and Honolulu (-1,500 jobs, -5 percent). The largest percentage decrease occurred in Lawrence-Methuen Town-Salem, Massachusetts/New Hampshire (-9 percent, -300 jobs), followed by Abilene, Texas (-7 percent, -300 jobs); Wichita Falls, Texas (-7 percent, -200 jobs); and Elmira, New York (-7 percent, -100 jobs). "There were 278,000 job openings in construction at the end of November, a record for the month, so it's likely that more metro areas would have had job gains in December if contractors had been able to find qualified workers," Simonson says. Association officials say that workforce shortages in the construction sector are limiting the full economic benefits of robust demand for construction in many parts of the country. They urged federal officials to increase funding for career and technical education and to enact comprehensive immigration reform that will allow more people to legally work in construction. “Exposing more high school students to construction as a career choice will help connect more young adults to high-paying careers in construction, while reforming the nation’s immigration laws will create more opportunities for workers to legally enter the country and begin contributing to the economy,” says Stephen E. Sandherr, the association’s chief executive officer. The metro employment data, rankings, top 10, history and map are available online. Case before state’s supreme court raises leachate concerns with mixed C&D debris in old quarries. The supreme court of the State of Illinois is considering a case brought before it which argues that old quarries that became mixed C&D debris landfills need to be monitored for groundwater concerns. According to an online report from TV station KWQC of Davenport, Iowa, the Illinois Environmental Protection Agency (EPA) is the plaintiff in the suit, and its argument extends to “dozens” of such landfills in the state. The practice of using obsolete rock quarries to hold concrete, wood, asphalt and other discarded construction and demolition materials occurs in several states in the United States. The Illinois EPA and officials in Will County, which has a growing population of Chicago suburbanites, express concerns that heavy metals and other chemicals could be present in the C&D materials, and they could subsequently leach into nearby groundwater. According to KWQC, Will County has nine such quarries, in a jurisdiction where “70 percent of residents rely on groundwater” for everyday use. The Supreme Court has indicated it is focusing on whether the Illinois Pollution Control Board failed to follow existing law when it left groundwater monitoring out of its 2012 rules for C&D debris landfills. New recycling plant is located in Portland, Oregon. Portland, Oregon-based Urban Gypsum has announced the opening of a 75,000-square-foot drywall processing and recycling plant in that city. The company’s new facility can separate the paper backing from the gypsum material and create a fine gypsum powder. The material produced is expected to be used as an agricultural soil amendment and plant nutrient. “We’re excited to be bringing specialized recycling technology to the Pacific Northwest,” says Casey Lane, Urban Gypsum’s president. Urban Gypsum has been created in partnership with Portland-based Willamette Construction Services Inc., and Lane says that company’s experience in previous decades prompted it to explore drywall recycling options.